With the support of the Capacity Building for Responsible Minerals Trade, IPIS developed and implemented a methodology aimed at assessing the responsible sourcing potential of gold mining areas in South-Kivu. IPIS conducted field missions in seven gold trading hubs and their surrounding mines in South-Kivu: Shabunda centre (Shabunda territory), Katchungu (Shabunda territory), Mapimo (Shabunda territory), Matili (Shabunda territory), Kaziba (Walungu Territory), Mukera (Fizi territory), and Nyawaronga (Kalehe territory). In each hub, IPIS surveyors collected quantitative and qualitative data through a combination of observations and interviews with a selection of stakeholders at and around mining sites and trading hubs. At mining sites, people interviewed included artisanal miners, shop keepers, representatives of cooperatives (when existing) and heads of miner camps. In each of the hubs, nine conditions impacting on the hubs’ potential for responsible sourcing were assessed: security, accessibility, mining sites status, production, the presence of cooperatives, the behavior of local authorities, the presence of civil society, health and safety and the organization of the gold trade. For each of these nine categories, several indicators (50 in total) were identified. These categories and indicators are based on the Annex II of OECD Due Diligence Guidance for responsible Supply Chain and the LBMA (London Bullion Market Association) Responsible Sourcing Initiative, and inspired by IPIS long experience of site evaluations. The objective of the assessment reports is to assist stakeholders in their evaluation of the responsible sourcing potential of each of these hubs. The reports scrutinize the strengths, challenges and opportunities of each hub and the mining sites supplying them. This cross-case analysis compares the overall potential of all seven hubs, thereby identifying important differences, trends and challenges. IPIS believes some of these findings are relevant for the whole of South Kivu. To explore the mine sites visited for this project on a map: access the IPIS DRC webmap. 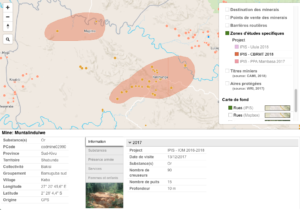 Use the “Zones d’études specifiques” layer and select the CBRMT project to localise the mines.